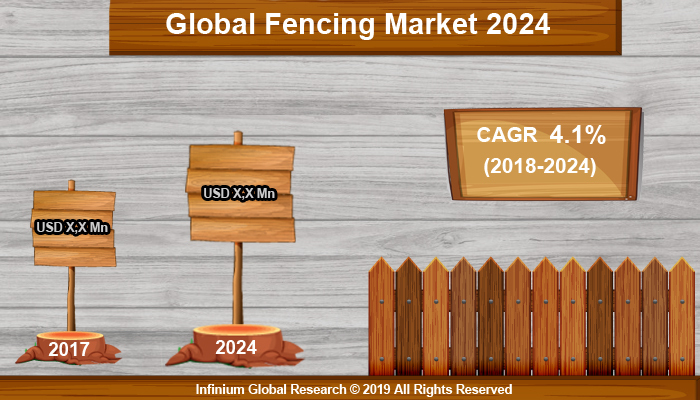 A recent report published by Infinium Global Research on fencing market provides in-depth analysis of segments and sub-segments in the global as well as regional fencing market. The study also highlights the impact of drivers, restraints, and macro indicators on the global and regional fencing market over the short term as well as long term. The report is a comprehensive presentation of trends, forecast and dollar values of global fencing market. According to the report, the global fencing market is projected to grow at a CAGR of 4.1% over the forecast period of 2018-2024. The fence is a standalone structure that encloses an area and designed to provide additional security, protection and privacy to a property. A fence is lighter in weight than the wall and connected by netting or rails, wire, and boards. Fence creates a boundary demarcation between a field, yard, industrial buildings, and various structures to provide security. Fences are available in several types that include wood, chain-link, vinyl, farm, and aluminum. Growing consumers concern towards the safety and security drives the growth of the fencing market. Moreover, increasing use of fencing in agriculture to keep livestock control that in turn boost the growth of the fencing market. Furthermore, rising construction activities, commercial and residential projects, renovation or remodeling as well as decoration in new structures to enhance the appearance of a property fuel the growth of the fencing market. In the defense industry, to protect and defend federal and military sites the industrial fences are used. Industrial fences provide high security as well as strength and durability to military sites that in turn propel the growth of the fencing market. Fencing is regulated in most of the developed areas mainly in residential, commercial, and agricultural areas that boost the growth of the fencing market. However, the overall huge cost of fencing and fluctuation in prices of raw material may hamper the growth of the fencing market. Moreover, governments rising investments for augmenting public infrastructure as well as government premises provide beneficial opportunities for fencing market. Geographically, North America dominates the fencing market owing to rapid growth in construction activities as well as increasing commercial projects in the region. The U.S is the leading country that spends the highest amount on defense and security deployments that in turn drives the growth of fencing market in the North America region. The Asia Pacific is anticipated to grow at a significant rate owing to factors such as development in the agriculture sector and increasing disposable income contribute to the growth of the fencing market in the region. In the UK, the adoption of fences in the military industry has been increased. Electric barrier fence upgraded for faster deployment in the UK that in turn provides fruitful opportunities for fencing market in the region. The report on global fencing market covers segments such as type, application, and end-user. On the basis of type, the sub-markets include wrought iron fences, wood fences, aluminum fences, vinyl fences, farm fences, and commercial fencing. On the basis of application, the sub-markets include agricultural/livestock wire fence, commercial wire fence, national borders, and others. On the basis of end-user, the sub-markets include residential, agriculture, industrial, and others. The report provides profiles of the companies in the market such as Allied Tube & Conduit, Jerith Manufacturing, Ameristar Perimeter Security, Betafence, Associated Materials, Inc., Bekaert, Long® Fence, Ply Gem, Gregory Industries, Inc., and CERTAINTEED. The report provides deep insights into the demand forecasts, market trends, and micro and macro indicators. In addition, this report provides insights into the factors that are driving and restraining the growth in this market. Moreover, The IGR-Growth Matrix analysis given in the report brings an insight into the investment areas that existing or new market players can consider. The report provides insights into the market using analytical tools such as Porter's five forces analysis and DRO analysis of fencing market. Moreover, the study highlights current market trends and provides forecast from 2018-2024. We also have highlighted future trends in the market that will affect the demand during the forecast period. Moreover, the competitive analysis given in each regional market brings an insight into the market share of the leading players.